But it does take quite a lot of effort to ensure that the whole season does not become completely overwhelming. It is always a very busy time. There are Christmas cards to send, presents to make for family and friends, decorations to hang, food to prepare and practices and performances for concerts and plays. I find it helpful to use a Christmas planner I designed for our church’s Sunday school to keep track of all the events and all the things which must be done. Sprite uses the planner now too; but she has very high expectations about what Christmas should be like. P’est Pour Parfait, the perfectionist poodle, always insists that everything must be perfect for Christmas and causes Sprite anxiety about every aspect of the season, especially about performing in the concerts and plays. Now her concerns are more often for others who are not celebrating and do not receive any gifts and this can cause her to be upset as she opens her own presents. But the main difficulties associated with the holiday season are in the areas of sensory overload. All the Dabrowski Dogs become very involved with all the holiday activities. This is both a blessing and a problem. It is always easier to manage if the holidays are spent at home but can be harder if visiting. There is always so much noise and excitement. 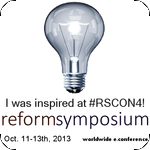 Often sugar and artificial colouring laden foods are being served. These can all affect moods and behaviour and it is often are not understood by other people. The Black Dogs try to creep in and ruin the season for her. Sprite does love Christmas at a deep spiritual level. Every sight, sound and scent is magnified for her and she finds significance even in shades of colour. She needs time and space to escape from the hurly-burly to be quiet and just enjoy Christmas in her own way. 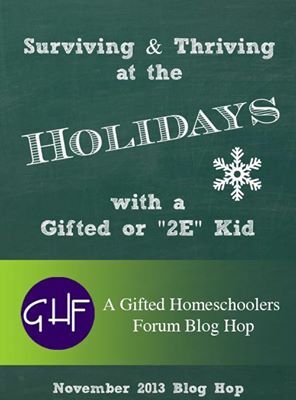 This is a post in the Gifted Homeschoolers Forum November 2013 Blog Hop Surviving and thriving at the holidays with a gifted or 2E kid.